The World Through My Eyes: 11th January - What Happened Today? I had steamy chicken rice today for lunch, now I'm suffering from Eating-Too-Much-And-Now-I'm-Sleepy syndrome. So, to avoid from drooling on my table, I did a fun search on the net on what happened on the date itself. 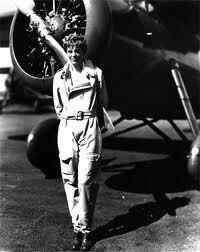 11th January 1935 - Amelia Earhart began her solo flight trip across the Pacific Ocean today. She was the first person to fly across this water. The trip passed Honolulu, Hawaii and then to California. If you remember, she is the character in Night in the Museum 2 - the Battle of Smithsonian. 11th January 1958 - The King of Rock and Roll, Elvis Presley released his single Jail House Rock today. 11th January 1878 - Milk delivered in bottle first time today. and today is The Secret Pal Day! Wouldn't hurt to flirt today guys!